Nashville, TN – Much to the excitement of Prog fans worldwide, The Neal Morse Band will be releasing a new live 2CD/DVD set and Blu-ray on August 5, 2016 titled “Alive Again.” Riding on the tremendous success of their breakthrough album, “The Grand Experiment,” The Neal Morse Band set out on a tremendously successful world tour in the spring of 2015. Neal Morse and Mike Portnoy have teamed up with Randy George, Eric Gillette, and Bill Hubauer to create one of the greatest progressive rock bands of all time. Full stop. “Alive Again” will be available as a DVD/2CD set and a standalone Blu-ray and shows the band at the top of their form performing for a rousing audience in The Netherlands on March 6, 2015. July 16, 2012 – Nashville, TN—Coming off of a highly successful 2011 marked by the release of the critically acclaimed “Testimony 2” and an enthusiastically attended tour throughout the U.S., Mexico and Europe, Neal Morse could easily have justified going on a creative hiatus to catch his breath. But that would fly in the face of his convictions and the sense that he is being led to build upon the swell of success he is experiencing. Morse’s long time studio partner and friend Mike Portnoy had a small window in January 2012 when he could record. The only problem was, there was only one song and a few bits and pieces written. Taking a leap of faith, he scheduled a recording session with the drumming legend and longtime bass player Randy George in two weeks, hoping that the music would arrive before the musicians. And boy did it ever. “Momentum” features five exceptional stand alone songs and one longer conceptual piece. In addition to the accessible title track, there’s the quirkily clever, Gentle Giant-inspired “Thoughts Part 5,” which follows in the footsteps of the previous “Thoughts” tracks penned by Morse with Spocks Beard. “Smoke and Mirrors” trods an introspective, acoustic path, while “Weathering Sky” offers a raucous cry for deliverance and renewal from a searching soul. Rounding out the shorter tracks is “Freak,” an upbeat, strings-charged song unlike anything Neal has recorded to date. Last comes “World Without End,” a near 34-minute, six-part epic that contains everything that defines Morse as a master of the genre. Another highlight of this record is that, in addition to a masterful solo by guitar wizard Paul Gilbert, there are contributions from Adson Sodré, Bill Hubauer and Eric Gillette—three musicians who were selected as members of Morse’s new touring band through an exciting YouTube driven open audition process. While “Momentum” propels Morse forward and further cements his standing as a prolific progressive rock icon, it steers clear of the potential “more of the same” trap, and features fresh musical angles and some of the finest performances to date by the Morse, Portnoy, George team. The release of “Momentum” on September 11 will be quickly followed up by a North American tour that spotlights the fresh talent of his new live band, with stops in such cities as Nashville, Jacksonville, New York, Chicago, Denver, Los Angeles, Seattle and Mexico City. 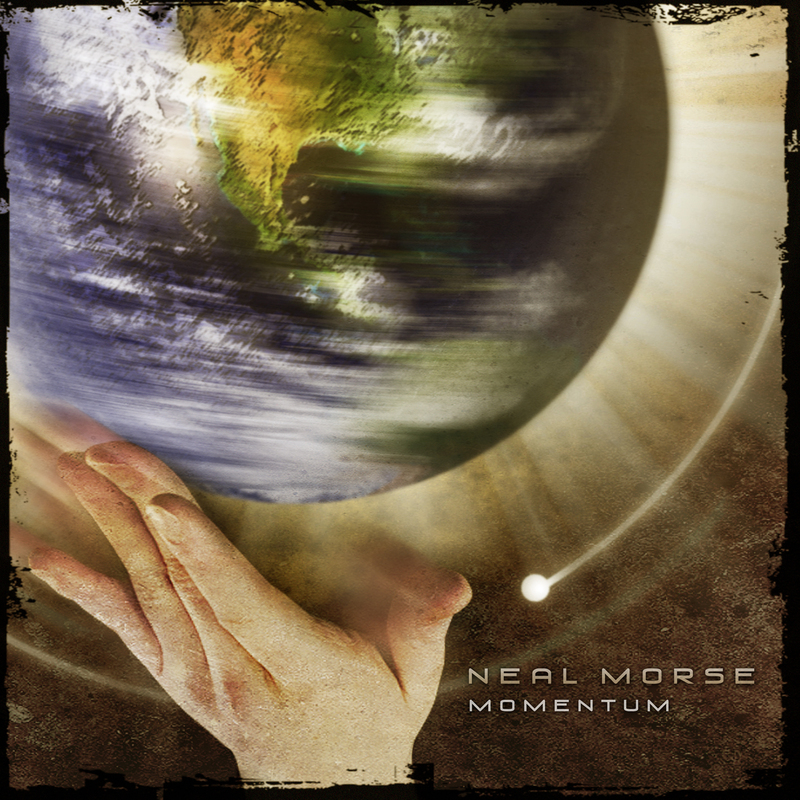 Much to the delight of progressive rock fans around the globe, Neal Morse is moving ahead with “Momentum,” and there doesn’t appear to be any kind of end to his unique creative talent in sight. 2011 has been a banner year for progressive rock, the genre that emerged in the late 1960s, peaked in the mid 1970s, and was threatened with extinction (certainly from a commercial perspective) with the advent of punk and new wave. Of course, prog never went away, and the music of seminal bands such as King Crimson, Genesis, Yes, Emerson, Lake and Palmer and Gentle Giant continues to sell well, forty years after some of them first emerged. If anything, prog’s resurgence—which really began, with urgency, when the internet and message boards provided a place for fans spread around the world to unite and become a surprisingly powerful force, despite being nowhere near the millions that supported the music back in the day. Prog certainly doesn’t sell the numbers it used to, but the past twenty years have seen a gradual increase in interest, as groups such as Porcupine Tree, Spock’s Beard and The Flower Kings emerged and began playing to full houses. CD sales may not be what they used to be, but clearly there’s enough support to justify the prolificacy of a number of specific players, who have become surprisingly significant movers and shakers in their particular neck of the woods. Two specific artists seem to be tirelessly releasing at a rate that few others can match (with the exception of Porcupine Tree’s Steven Wilson). Keyboardist/guitarist/vocalist Neal Morse has, since forming Spock’s Beard and releasing The Light (Radiant Records) in 1994, gone through his own journey, one that found him leaving Spock’s Beard after the release of the two-disc concept record, Snow (Radiant, 2002)—a not particularly hidden reflection of his increasing faith and decision to focus his energies more directly on spiritual pursuits. But even though his subsequent solo albums—amongst them Testimony (Radiant, 2003), ? (Radiant, 2005) and Lifeline (Radiant, 2008)—have all dealt with matters of religious discovery/rediscovery, they’re still unapologetically progressive rock records—Christian prog, if a label is required. Swedish guitarist/vocalist Roine Stolt is, like Morse, not exactly a spring chicken—both are over fifty, with Stolt having just turned 55 in September, 2011. He may qualify, then, for dinosaur status but, again like Morse, a youthful appearance, tireless work ethic and unequivocally modern approach to prog—even as he pays plenty of references to the bands that informed him when he was growing up—have made Stolt increasingly relevant. Cutting his teeth with Swedish prog group Kaipa in the mid 1970s, he worked in relative obscurity, however, until the mid 1990s, when he released The Flower King (Foxtrot, 1994), a stunning symphonic prog record that led to the formation of The Flower Kings, which would go on to release a dozen records between 1995 and 2007 (not including compilations), including certifiable classics Stardust We Are (Foxtrot, 1997) and Unfold the Future (Foxtrot, 2002). Ascending in the prog world individually, it was when Morse and Stolt came together in Transatlantic, however, that their careers seemed to kick into even higher gear. A contemporary progressive rock supergroup with (now ex-) Dream Theater drummer Mike Portnoy and Marillion bassist Pete Trewevas, Transatlantic released two fine studio albums and two live albums between 2000 and 2003, before Morse pulled the plug, as he did with Spock’s, to refocus his energies on his solo career and Christian prog. The hype was high when Transatlantic reunited in 2009 for The Whirlwind (Radiant), a 78-minute, continuous concept album that led to a 2010 world tour (including a stop in Montreal, Canada and Whirld Tour 2010 (Radiant, 2010), a mammoth three-CD and/or two-DVD set that documented the group’s London, England show). Both Morse and Stolt are predisposed to writing progressive rock epics—long pieces, often suite-like in nature—but Transatlantic upped the ante with The Whirlwind and the subsequent tour, its shows eclipsing the three-hour mark despite playing only six pieces that, with the exception of two shorter breathers—the power ballad “We All Need Some Light,” from its debut, SMPT:e (Radiant, 2000), and the more ethereal title track to 2001’s Bridge Across Forever (Radiant)—all clocked in at 25 minutes or greater. “The epic to end all epics” was Morse’s mantra in his early days, when he composed “The Great Nothing,” on Spock’s Beard’s V (Radiant, 2000), but it’s become somehow meaningless, as he continues to deliver epic after epic, both on his own records and with Transatlantic. The same can be said for Stolt, whose latest group project, Agents of Mercy—again, with unrelenting prolificacy, releasing three studio recordings and one live album since its inception in 2009—has lept into the “concept album” arena with The Black Forest. Together and apart, Stolt and Morse have a collective total of five records out this year, with Stolt on Agents of Mercy’s The Black Forest, a live Flower Kings recording from 2007 with guest drummer Pat Mastelotto (King Crimson, KTU), Tour Kaputt (Reingold Records, 2011), and More Never is Enough (Radiant Record, 2011), documenting two more shows from Transatlantic’s 2010 Whirld Tour on a five-disc set (three CDs from the group’s show in Manchester, England, and two DVDs from the Tilburg show in The Netherlands). Morse, in addition to the Transatlantic set, has released Testimony 2—Live in Los Angeles (Radiant Records, 2011), another three-CD/two-DVD set, in support of Testimony 2 (Radiant Records), his 2011 studio follow-up to 2003’s Testimony, released just five months ago. Between these five releases, it’s manna from heaven for those who want to hear a contemporary take on the classic prog heyday of the 1970s. When Roine Stolt first formed Agents of Mercy in 2008 with singer Nad Sylvan, it was intended to be a more acoustic, less symphonic alternative to The Flower Kings, which was on hiatus after the release of The Sum of No Evil (Foxtrot) in 2007. But as much as The Fading Ghosts of Twilight (Foxtrot, 2009) was lighter and less epic than TFK, Stolt couldn’t deny his inner prog, especially with AoM also featuring Jonas Reingold—a far-reaching bassist whose virtuosic tendencies elevated TFK when he joined that group in 2000 for Space Revolver (Foxtrot). After a double-bill tour where Reingold’s Karmakanic merged with AoM to perform music from both groups—documented on The Power of Two (Reingold, 2010)—AoM’s next studio recording, Dramarama (Foxtrot, 2010) was already leaning towards a heavier prog tendency, with über-keyboardist Lalle Larsson (a member of both AoM and Karmakanic) ramping up the symphonic side of the group, while still maintaining plenty of distance from TFK. The combination of Stolt, Reingold, Larsson and drummer Walle Wahlgren also meant that AoM had the instrumental virtuosity to stretch into areas approaching the early 1970s fusion of Mahavishnu Orchestra—Reingold and Stolt have even released an album, under the moniker 3rd World Electric, that was a heartfelt tribute to Joe Zawinul and Weather Report. But the increasing participation of Sylvan on the writing front (Fading Ghosts was written entirely by Stolt; Dramarama, while still largely from his pen, included three tracks by Sylvan, and two collaborations between the two) began to open the group up, even as it steadfastly avoided some of the excesses endemic to prog—cheerfully and unapologetically retained in Transatlantic—specifically, staying within shorter song forms (only three tracks over seven minute and all under ten). With The Black Forest, Agents of Mercy makes the full leap into classic prog, with a 56-minute concept album that tackles some of the themes that have occupied Stolt for years, including the temptations of lust and greed, transcended by Christian morals that have made the Swedish guitarist such a perfect writing companion with the born-again Morse in Transatlantic. It’s also AoM’s hardest-hitting album to date, with the 11-minute title track beginning aggressively, and making clear that Stolt, who’d somewhat subdued his guitar playing on earlier discs, was taking a more prominent position along with Wahlgren, whose drums are far more upfront in the mix this time around. Reingold’s Chris Squire-toned bass combines with Larsson’s synths, church organ, and mellotron strings and choir, on one of Stolt’s most episodic tracks since TFK. Sylvan’s “A Quiet Little Town,” paradoxically, rocks harder still, the song finding a perfect nexus between classic Yes and Gabriel-era Genesis. Sylvan’s vocal arrangements come from a choral tradition, and while it’s uncertain how he’d replicate them live (the a capella intro to Stolt’s “Black Sunday,” for example), there’s no doubt that while Stolt is AoM’s primary mover and shaker—producing the record, as he did the previous two, and writing six of The Black Forest’s eight tracks, with Sylvan covering the rest—Sylvan is increasingly definitive to the group’s sound. There’s no denying the references to TFK, with the participation of Stolt and Reingold, but Agents of Mercy has its own variant complexion. In its harder edge and more decidedly symphonic prog tendencies, The Black Forest has now bridged the gap between Agents of Mercy and The Flower Kings so completely that it places the future of Stolt’s flagship group into question. With a similarly layered approach to recording and an increasing predilection for epic writing, what would be the reason to reunite The Flower Kings at this point? The answer to that question may well be Tour Kaputt—Official Bootleg, Live @ De Boerderil, which documents The Flower Kings 2007 tour in support of The Sum of No Evil, with Flower Kings founding members Stolt and keyboardist Thomas Bodin alongside Reingold and singer/guitarist Hasse Fröberg (who joined a little later but remain stalwart), recruiting drummer Pat Mastelotto to sit in for the absent Zoltan Csörsz. It sounds like a marriage made in prog heaven, with Mastelotto the engine behind incarnations of King Crimson from the mid 1990s forward, until its (apparently) final dissolution in 2008. No stranger to mindboggling time changes and long-form compositions, his assimilation into TFK sound is, nevertheless, remarkable, as he incorporates his signature electronics into the mix, while playing with a more direct approach that updates the group’s classic sound. The two-CD (also available on DVD), thirteen-song, nearly two-and-a-half-hour set weighs heavily on The Sum of No Evil, including the 27-minute “Love is the Only Answer,” “Trading My Soul,” “Life in Motion,” “Brimstone Flight 999” and “The Sum of No Reason”—stretched out by half to include a fiery, up-tempo mid-section that pits Stolt against Mastelotto in the closest thing TFK comes to flat-out rock and roll. If Stolt’s playing has become more dominant in Agents of Mercy, he remains a far more visible front man in TFK—not only because he shares lead vocal duties with Fröberg, rather than taking only the occasional lead spot from AoM’s Sylvan)—but because his guitar work is all over TFK in ways that it still is not with AoM. If there’s a progressive rock guitar god for the 21st century, following in the footsteps of (and influenced by) everyone from Robert Fripp and Steve Howe to Allan Holdsworth and John McLaughlin, it’s Roine Stolt. And none of these certifiable icons possess, with the exception of Fripp’s Soundscapes, Stolt’s textural breadth, nor can they evoke the same vocal-like humanity from a wah wah pedal. The liners to Tour Kaputt—Official Bootleg, Live @ De Boerderil make clear that this was a tour with plenty of challenges—from hitting an elk in the tour van on the way to Oslo and encountering a potentially sticky immigration/visa problem on entering the UK, to Reingold’s excruciatingly painful ruptured disc. But travails can sometimes cause a band to actually play better, and that certainly seems to be the case on Tour Kaputt. It’s only been two years since Neal Morse released his last live record, So Many Roads (Radiant Records, 2009), and despite that show being over three hours and spanning much of his solo career to date, with nods to Spock’s Beard and Transatlantic, there’s surprisingly little crossover on Testimony 2—Live in Los Angeles, recorded during a six-date US tour in support of the studio set, Testimony 2, released earlier this year. With the exception of the title track to Lifeline, that same album’s aggressive “Leviathan,” bits of “Testimedley” and “Reunion,” from ?, everything else on Live in Los Angeles is performed for live for the first time. Portnoy is at the back of the stage, rather than his more prominent position with Transatlantic, but he still connects directly with his audience, and lifts the energy of the entire band, especially during the complete performance of Testimony 2’s first and main title disc, which occupies the third CD and second DVD of this five-disc set. And while Neal Morse is no Steve Morse, the Dixie Dregs guitarist who guests on the studio version of Testimony 2’s “Seeds of Gold”—the 25-minute epic that’s an early highlight of this live show—he’s no slouch either. But with Testimony 2 barely out half a year, is there a need for a complete live version of its first-disc follow-up to Testimony—less a sequel and more an expansion of the story of Morse’s gradually becoming born again, filling in a series of blanks, including the miraculous recovery of his daughter, Jayda, born with a hole in her heart, and the time spent on the road as a member of Eric Burdon’s touring band? Absolutely. As strong as the studio record is, the live version is simply more powerful, more majestic, more transcendent. That some of the players have sheet music in front of them reveals another aspect to Morse’s musical résumé. But while reading from the page can sometimes get in the way of the music, that’s never the case here, with everyone shining, both individually and collectively on a segment from Sola Scriptura (Radiant Records. 2007) and, “The Separated Man,” from One (Radiant Records, 2004). A 90-minute tour documentary, put together by Randy George, provides plenty of insight into the challenges of launching an ambitious tour on a relatively small scale (only six US dates performing in relatively small halls). But it’s the performance that itself that recommends Live in Los Angeles. Morse’s faith is front and center here (as is Morse himself), but what comes through is a man whose faith is absolutely genuine. He doesn’t preach, he reports; and if there are too many charlatans in the world of organized religion, the world needs more people like Morse, whose spirituality is infectious and who has, indeed, managed to carve out a unique place for himself in progressive rock. Morse may not proselytize, but with Testimony 2—Live in Los Angeles, Morse’s energy, unassuming honesty, commitment and clear faith could well reach some new believers. And so, individually, Stolt and Morse have released records that put them at the top of their respective game. But what of when they come together as Transatlantic? The term “sum of the parts being greater than the whole” is something bantered about liberally, especially in supergroup contexts such as this, but it’s hard to deny the collective energy and flat-out fun that Transatlantic has on tour. The Whirld Tour 2010 live set demonstrated the potent positivism of Transatlantic in concert, though it came under some criticism, by some, for a weak low end that didn’t capture the majestic power, say, of the group when bassist Pete Trewevas was using his Taurus bass pedals. Still, with a full live show documented in certainly more than acceptable audio and multi-camera video, was there really a need to release another CD/DVD set? Based on More Never Is Enough—Live @ Manchester & Tilburg 2010, the answer? An emphatic yes. With the CD documenting a particularly loose show in Manchester, England, and the DVD capturing the group’s final performance of its European tour in Tilburg—the same Netherlands location where the same group recorded Live in Europe (Radiant Records, 2003), from its 2001 tour in support of Bridge Across Forever—the set doesn’t render Whirld Tour 2010 irrelevant, though it does resolve the bottom end issues. Instead, it shows Transatlantic to be a group that may perform exactingly detailed progressive rock epics, but it’s also a group of players capable of interpreting the music differently each night, in particular Stolt, who makes any Transatlantic set worth hearing. Little gets written about the group’s touring fifth member, Daniel Gildenlow—whose own group, Pain of Salvation, leans more towards the metal side of prog and was formed when he was just 11. He looks a lot younger than his nearly 40 years, and rarely gets the spotlight, but between supporting guitar, keyboard, percussion and vocal work, he makes it possible for Transatlantic to better replicate its layered studio productions on stage, and he’s a strong visual part of the group, his youthful energy making him an absolutely essential member. And while he only gets one brief vocal solo, on the main show closer, “Duel With the Devil,” he brings his own grit and fire to Morse’s lyrics, which continue to focus on spiritual searches, but in a less blatantly born again fashion than in his own solo work. As ever, Morse delivers a religious message without didacticism, giving his own music, with its far more direct message, the same crossover appeal as his collaborative writing for Transatlantic. Vocally as strong as ever, his keyboard work is an impressive match for Stolt’s, especially his organ work, and his own background working in Eric Burdon’s touring band and a myriad of other groups, means he’s got a similarly broad frame of reference, with echoes of jazz during the “Set Us Free” portion of The Whirlwind, and tinges of Harold Budd ambience during the atmospheric intro to “Bridge Across Forever,” the first of two encores that, together with “Stranger in Your Soul,” clocks in at nearly 45 minutes. Having five vocalists also works to great advantage, and while Morse is, far and away, the singer most in the spotlight, Stolt changes roles with the keyboardist on “We All Need Some Light,” singing it as he did in a version only available on the now out-of-print limited edition of SMPT:e. And while they’re not perfect—Portnoy’s occasional lead spots are a little rough around the edges, but his enthusiasm remains infectious—it’s the warts-and-all nature of More Never Is Enough that makes it a worthwhile alternative to Whirld Tour 2010. And while Whirld Tour 2010 had, as a bonus feature, Transatlantic playing Genesis’ “The Return of the Giant Hogweed,” with ex-Genesis guitarist Steve Hackett, at their High Voltage festival performance later that year, More Never is Enough includes a final third encore, the band’s first performance of the song—without rehearsal. Surprisingly—or, perhaps, not so surprisingly given how connected everyone is to this music—everyone pulls it off. With Whirld Tour also including a tour documentary, what’s left for More Never is Enough are four bonus segments called “Stranger Jams,” taken from four different performances, that, with everyone in the group switching instruments, demonstrate the fun these guys have onstage, whether it’s Portnoy’s impromptu bass pedal solo, his crowd-diving, or an unexpected descent into 1970s pop with Blue Swede’s “Hooked on a Feeling.” The “Stranger Jams” may only be worth one watch, but they demonstrate Transatlantic as a group that doesn’t stick to a script. If this is, indeed, the end of the group’s three-year Whirlwind project, starting with the studio album and ending with More Never Is Enough—Live @ Manchester & Tilburg 2010, then it may well have to be enough. But with a group whose members have their own projects, and with Roine Stolt and Neal Morse’s tireless energy to keep coming up with something new, it would be a shame if Transatlantic ended here. It may be an on-again/off-again project, but here’s hoping it becomes on-again real soon. In the meantime, projects like Agents of Mercy, The Flower Kings and Neal Morse’s solo projects—along with Trewevas’ ongoing work with Marillion, and Portnoy, now a free agent after leaving Dream Theater in the fall of 2010, participating in a variety of other endeavors, will keep everyone—but especially Stolt and Morse—alive in the eyes, ears and minds of prog fans around the world. Tracks: The Black Forest; A Quiet Little Town; Black Sunday; Elegy; Citadel; Between Sun & Moon; Freak of Life; Kingdom of Heaven. Personnel: Nad Sylvan: lead and backing vocal, keyboard; Roine Stolt: guitars, vocal; Lalle Larsson: keyboards, vocal; Jonas Reingold: bass; Walle Wahlgren: drums. Tracks: CD1: Love is the Only Answer; There is More to This World; Retropolis; Trading My Soul; Hudson River Sirens Call; I Am the Sun. CD2: Life in Motion; Brimstone Flight 999; Babylon; Stardust We Are; What If God is Alone; Blade of Cain; The Sum of No Reason. Personnel: Roine Stolt: guitars, vocals; Tomas Bodin: keyboards, vocals; Hasse Froberg: guitar, vocals; Jonas Reingold: bass; Pat Mastelotto: acoustic and electronic drums. Tracks: CD1: Lifeline; Leviathan; The Separated Man; Sola Scriptura. CD2: Seeds of Gold; Testimony 1, Part 5; Reunion. CD3 (Testimony 2): Mercy Street; Overture No. 4; Time Changer; Jayda; Nighttime Collectors; Time Has Come Today; Jesus’ Blood; The Truth Will Set You Free; Chance of a Lifetime; Jesus Bring Me Home; Road Dog Blues; It’s For You; Crossing Over/Mercy Street Revisited. DVD1: Testimony 2 Concert Part 1. Bonus Feature: Neal Morse High Voltage Reunion with Spock’s Beard. Runtime: 109 minutes. DVD2: Testimony 2 Concert Part 2. Bonus Feature: Tour Documentary. Runtime: 186 minutes. Personnel: Neal Morse: keyboards, guitars, vocals; Randy George: bass; Mike Portnoy: drums. Rick Altizer: keyboards, guitar, vocals; Nathan Girard: keyboards, vocals; Eric Brenton: guitar, violin, flute; Nathan Brenton: cello, guitar, vocals; Mark Leniger: saxophone, percussion, vocals. Tracks: CD1 (Live in Manchester): The Whirlwind. CD2 (Live in Manchester): All of the Above; We All Need Some Light Now; Duel With the Devil. CD3 (Live in Manchester): Bridge Across Forever; Stranger in Your Soul. DVD1 (Live in Tilburg): The Whirlwind. Runtime: 81 mnutes. DVD2 (Live in Tilburg): All of the Above; We All Need Some Light; Duel With the Devil; Bridge Across Forever; Stranger in Your Soul; Return of the Giant Hogweed. Bonus Features: Stranger Jam Clips (Cologne, Stuttgart, Esch Alzette, Pratteln). Runtime: 143 minutes. Personnel: Neal Morse: keyboards, vocals, acoustic guitar; Roine Stolt: electric guitar, vocals; Peter Trewevas: bass, bass pedals, acoustic guitar, vocals; Mike Portnoy: drums, vocals; Daniel Gildenlow: keyboards, guitars, vocals, percussion. Visit Agents of Mercy, The Flower Kings, Neal Morse and Transatlantic on the web.